Temporomandibular joint disorder, or TMD, causes jaw pain that may be mistaken for recurring tension headaches according to a recent study of TMJ symptoms. Jaw pain due to TMJ symptoms will not respond to tension headache treatment. Instead, such pain must be treated in the same way traditional TMJ symptoms. The TMJ, or temporomandibular joint, is the joint that connects the lower jaw to the skull. Actually, two temporomandibular joints are located just in front of the ears, one on each side of the jaw. The TMJ joint allows you to move your lower jaw so you can talk and chew. Disorders of this joint may be referred to simply as TMJ or as TMD (temporomandibular joint disorder). In healthy people, the lower jaw that forms the TMJ joint are rounded and called condyles. When we open and close our mouths, the condyles glide along the TMJ joint sockets. To prevent wear and tear, a small disc acts as a shock absorber between the condyles and the socket. Between five to ten percent of the American population suffers from TMJ symptoms that require some form of treatment. The jaw pain associated with TMJ symptoms is similar to the joint pain associated with fibromyalgia, a condition often seen in women with sudden hormone changes (including menopause). Because TMJ and fibromyalgia often occur simultaneously in woman, doctors think a connection exists between the two. trigeminal neuralgia (a painful facial nerve condition). A recent study conducted by the University of Buffalo’s School of Dental Medicine researched the possibility that TMJ symptoms were being mistaken for tension headache symptoms. The study was led by Richard Ohrbach, an associate professor in the Department of Oral Diagnostic Sciences. The study’s intent was to examine the difference between TMJ joint pain versus tension headaches in clinical examinations. However, the focus of the study wasn’t limited to tension headaches. It also examined migraines, mixed migraines and sub-clinical headaches. All 583 participants in the study displayed TMJ symptoms. Because women are nearly twice as likely as men to display TMJ symptoms, women comprised 82.3 percent of the participants. Ohrbach and his research team discovered that, in 82 percent of cases, they could reproduce tension headache symptoms by performing standard clinical examinations of the temporomandibular joint. Consequently, the process of diagnosing TMJ symptoms, as set forth by the Research Diagnostic Criteria for Temporomandibular Disorders, was compared to tension headache diagnosis process. The study found that both patients and examining physicians may mistake tension headache caused by TMJ symptoms and jaw pain for classic tension headaches. Ohrbach notes that this is unfortunate, as “TMJ is very treatable, but if a jaw disorder is ignored, then treatment for the headache may not address all of the factors contributing to the headache.” Although TMJ symptoms were present in all participants, 152 were diagnosed with tension headaches, based on standard International Headache Society guidelines for tension headache diagnosis. Medical News Today. (16 May 2006). Study suggests tension headache may actually be TMJD. Headaches have become endemic in our culture. Almost every issue of any women’s magazine or health publication will have at least one article devoted to headaches. The purpose of this article is to help the reader understand more about the different types of headaches and explain one reason why so many people fall victim to an incorrect diagnosis, and wind up taking drugs, sometimes dangerous drugs, unnecessarily. Also learn how many people who had suffered with disabling headaches have been treated non-surgically and without drugs to attain a quality of life they had previously thought impossible. 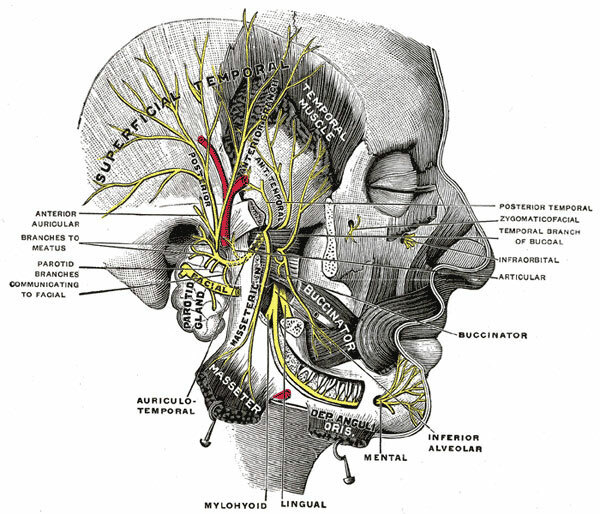 Your sinuses are located in your forehead, in the cheekbones on each side, and behind the bridge of your nose. When a sinus becomes inflamed, usually as the result of an allergic reaction, tumor, or infection, the inflammation will cause a localized pain, or headache in that area. Sinuses are filled with air, and their secretions must be able to drain freely into the nose. If your headache is truly caused by sinus blockage, such as infection, you will probably have a fever. An x-ray will confirm a sinus blockage. Your physician’s treatment may include antibiotics for the infection, as well as antihistamines or decongestants. If you do not have a true sinus headache, taking decongestants may make your headache worse. These headaches are called cluster headaches because the attacks come in-groups. The pain arrives with little or no warning. It has been described as the most severe and intense of any headache type. 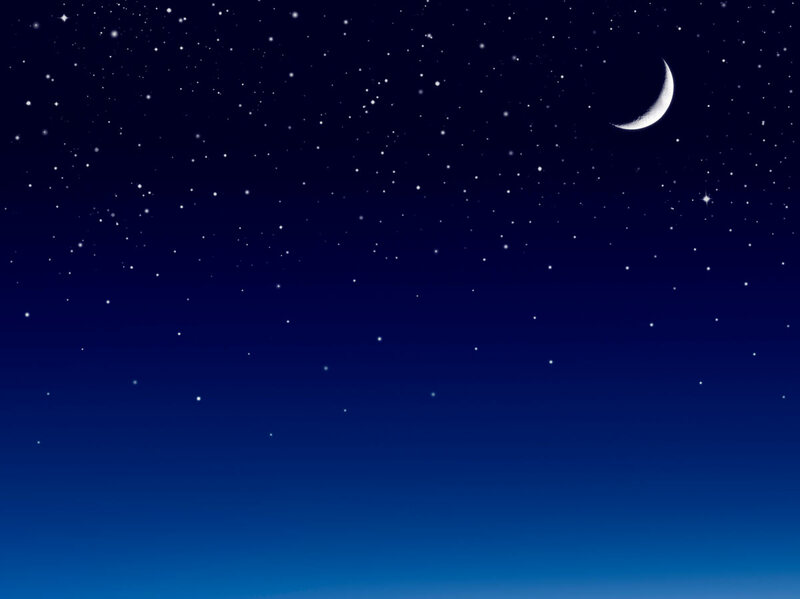 It usually lasts from 30 to 45 minutes, although it might persist for several hours before is disappears. Unfortunately, it can reoccur later in the same day. Most sufferers experience one to four headaches each day during a cluster period. Cluster headaches frequently occur during the morning or late at night. The cluster cycle can last weeks or months and then can disappear for months or years. Clusters often occur during spring or autumn and, thus, are often incorrectly associated with allergies. Less than 1% of the population are victims of cluster headache. They are about the only headache type that favors men (about 5 to 1) over women, and usually occur between the ages of 20 and 45. Cluster headaches were once considered a type of migraine, because it is vascular in nature. Cluster headaches are usually unilateral and rarely switch sides from one attack to another. You might feel the pain begin around one eye, like “jabbing a stick in your eye” or “pulling it out by its roots.” It may be accompanied by a tearing or bloodshot eye and a runny nose on the affected side. The pain can radiate from the eye to the forehead, temple and cheek on the same side. The pain is piercing, burning, throbbing, or pulsating, and so excruciating that most victims cannot sit still. They feel compelled to rock in a chair, pace back and forth, or even bang their heads against something. Tension-type headaches may be the result of stress or fatigue, but more than likely; they can be attributed to physical problems, psychological issues, or depression. Women are affected significantly more than men, usually beginning between the ages of 20 to 40. They can be either chronic or episodic in nature. They are characterized by a continuous, but not throbbing, pain in the forehead, temples, and/or the back of the head or neck. The muscles between the head and neck sometimes contract for hours or even days. It can feel like a tightening around your head and/or neck with only certain positions seeming to provide some relief. Migraines deserve the attention they receive; one headache can put your life “on hold” for a few hours or several days. The term migraine is originally derived from the Greek word “hemicrania,” which means “half the head.” For 70% of the sufferers, the headache does occur on one side of the head. Migraine is considered a vascular headache because it is associated with changes in the size of the arteries in and outside of the brain. The blood vessels are thought to become inflamed and swollen, and it is believed that migraine pain is caused by this inflammation, as well as by the pressure on the swollen walls of the blood vessels. There are several types of migraines, and every person will experience theirs in a different way. However, there are some basic features. They usually begin as a dull ache, and then progress into a constant, throbbing and pulsating pain at the temples, as well as the front or back of one side of the head. The pain is usually accompanied by nausea and vomiting, and sensitivity to light and noise. Most migraine sufferers experience two to four headaches per month, but some people get one every few days, while others may only have one or two a year. Most migraine headaches last at least four hours, although very severe ones can last up to a week. They may begin at any time of the day or night, but a migraine will rarely awaken a person from sleep. Most migraine sufferers experience visual problems during the headache. Some people have migraines, which begin with an “aura,” which begins from five to thirty minutes before the actual onset of the headache. Auras are a manifestation of neurological symptoms. These neurological disruptions may cause you to see wavy or jagged lines, dots, or flashing lights. You may even experience tunnel vision or blind spots in one or both eyes. The aura can include vision or hearing hallucinations. Disruptions in smell (such as strange odors), taste, or touch may also occur. It can become even more frightening if it involves feelings of numbness, a “pins-and-needles” sensation, or even difficulty in recalling or speaking the correct word. These neurological events may last up to an hour and will fade as the headache begins. The pain grows more intense with time. Nearly 20 million Americans suffer from TMJ headaches, and they are probably the least understood and most miss-diagnosed of all health problems. There are two primary reasons why TMJ headaches are so commonly undiagnosed or miss-diagnosed. The first reason is that the symptoms can be almost exactly the same as either the sinus headache, the tension headache, and the migraine headache, and occasionally like the cluster headache. In other words, it can mimic any of the other four major causes of headache. TMJ headaches also affect women (8 to1) more than men and they usually begin between the ages of 20 to 50, but they can begin either earlier or later. The second reason TMJ headaches are so commonly undiagnosed or miss-diagnosed is that physicians are almost totally untrained regarding diagnosis and treatment of TMJ dysfunction, because it is felt that TMJ falls under the domain of the dentist. Unfortunately, most dentists are also poorly trained regarding the problem. Although some dentists recognize TMJ problems, they are unable to accurately identify the source of the problem. Their best effort to manage the problem is to use a therapy that is directed solely toward the symptoms, and does absolutely nothing to resolve the underlying cause of the problem. Examples of such attempts include splint therapy; occlusal equilibration, night guards, and drugs. The symptoms of TMJ dysfunction are unbelievably diverse, both in nature and in severity. The most common symptoms are migraine-like headaches, which seem to come from behind the eyes or the side of the head. Also, there are the headaches or neckaches, which occur at the back of the head right where the neck attaches to the skull. People usually describe these neckaches as “tension headaches”, as they are often associated with stress. The pain often radiates down into one or both shoulders. Slightly less frequent, but occasionally more severe symptoms include vertigo (dizziness), ringing in the ears, lancing pain in one or both ears, hearing difficulties, stuffiness in one or both ears, light sensitivity in the eyes, ulcer-like pains in the stomach, low back pain, and poor posture. More obvious, but less severe TMJ symptoms include clicking, popping, and/or grinding (crepitus) in the jaw joint; tenderness or pain in the jaw joint; sore or painful muscles in the head, face, or neck; difficulty in chewing; fatigue of the jaw muscles after prolonged chewing or talking; limitations of the range of motion of the lower jaw; locking of the jaw in either the open or closed position; clenching or grinding the teeth; sensitivity of the teeth; and deviation of the jaw when opening or closing the mouth. There is rarely a day goes by in our office that we don’t see a person who has suffered from excruciatingly painful headaches which utterly destroyed the quality of their lives. Through a very unique method of diagnosis and non-surgical treatment, we have been able to restore health, comfort, and optimal functionality to those who had TMJ dysfunction. Included in this group are many who had been previously treated, sometimes for years, for other types of headaches as well as TMJ headaches. Tension-Type Headache: Up to 90% of headaches are tension-type headaches. These headaches are usually felt as a pressure or aching pain of mild to moderate severity. They can be unilateral or bilateral and often occur in the back of the head, on the sides of the heads, and around the eyes. These headaches are most frequently are caused by the muscles of the jaw and neck (See Cervicogenic). The temporalis muscle is frequently involved in headaches along the side of the head (See Myofascial Pain). It is commonly described as a tight band around the head. Muscles tension is commonly caused by trauma, repetitive strain, misaligned jaw or neck joints, poor posture, nerve impingements, and emotional stress. Poor sleep and diet are also linked to these headaches. As many factors can contribute to Tension-type headaches it is important that not only a thorough evaluation be done, but that contributing factors be identified and addressed. Tension-type headaches may be a trigger for migraine headaches and unlike migraines are usually made better with physical exertion. Migraine Headache: Migraines are typically felt as a unilateral throbbing pain of moderate to severe severity that lasts 4-72 hours. They are usually accompanied by nausea, sensitivity to light and sounds. In some cases the headache is preceded by a visual aura, which can appear as flickering objects at the periphery of the visual field. Some may experience a prodromal as an emotional feeling, craving for a food, or a physical sensation. Women are 3 times more likely than men to have migraines and can be associated with menstrual periods. Studies have shown that genetics plays the largest factor, as most people with migraines have a relative that also gets them. Migraines occur when the Trigeminal nerve, which innervates the blood vessels and lining of the brain, becomes irritated causing a release of chemicals resulting in the pain and throbbing sensation.Although the headache is similar, migraines with aura appear to be brought on by different mechanisms than migraines without aura. Migraines without aura can be brought on by excessive stimulation of the trigeminal nerve as occurs in tension-type headaches, myofascial pain, TMJ disorders, and dental pathology. By reducing the excessive stimulation of the trigeminal nerve can significantly reduce or eliminate migraines without aura. Other factors which may stimulate migraines include caffeine, alcohol, nitrates, changes in sleep patterns, bright fluorescent lights and stress. Most often migraines are treated with prophylactic medications. If migraines occur more than once a week they should be treated with a medication taken every day, otherwise they can be treated with abortive medications. These medications can have several severe adverse side effects therefore proper diagnosis should start with your family physician or neurologist. Bruxism (teeth clenching) and TMJ disorders can be potent triggers for migraines as the trigeminal nerve also innervates the jaw and jaw muscles. Therefore, in some cases migraine frequency can be significantly decreased with treatment of Bruxism and TMJ disorders. A dental splint has been approved by the FDA for treatment of migraines. In our office Botox into the jaw muscles and trigeminal nerve has also been shown to be effective treatment for jaw pain and migraines. Analgesic Rebound Headaches: These headaches occur when over-the-counter medications such as Tylenol, Excedrin, aspirin or prescription ergotamines or triptans are taken more than 2-3 days per week for treatment of headaches. These headaches are described as a daily dull ache that is caused by sensitization of the trigeminal nerve. Caffeine-Withdrawal Headache: These headaches occur through sensitization of the trigeminal nerve as well and may be described as a mild to moderate aching to throbbing pain. The amount of caffeine necessary to cause a headache depends upon the sensitivity of the individual. Sinus Headache: Contrary to what is believed, sinus headaches are relatively uncommon. Most headaches experienced around the sinus area are caused by tension or migraine headaches. Sinus headaches due occur during acute infection of the sinus lining. This is indicated by nasal discharge and stuffiness. Post-Traumatic Headache: These occur when the lining of the brain is disrupted due to impact with the skull. This can occur with a direct head trauma but has also occurred in a whiplash injury. It is often felt as a throbbing pain and can be accompanied by neurological symptoms such as nausea, dizziness, memory difficulties, or concentration problems. These headaches usually just take time to improve. Cluster Headache: This accounts for less than 1% of headaches. It is 6 times more prevalent in men than women. There is also an increased incidence among smokers and manic-depressives. It is a very intense unilateral pain often described as feeling like a hot-poker being thrust from the back of the head in behind the eye. It is often associated with other symptoms such as nasal drip, redness and tearing of the eye, and sweating on the affected side. The pain tends to come on quickly in periodic intervals of 4-8 weeks of attacks and remission. Most attacks occur at night and alcohol is the most common trigger for cluster headaches. Besides medications physical exertion and ice can provide relief for these headaches. Cervicogenic Headache: This usually comes from disturbances at the level of C1 and C2. It is commonly felt as a chronic aching pain that can become sharp with head movement or postural strain. Whiplash injuries and poor posture are a common cause of these disorders. 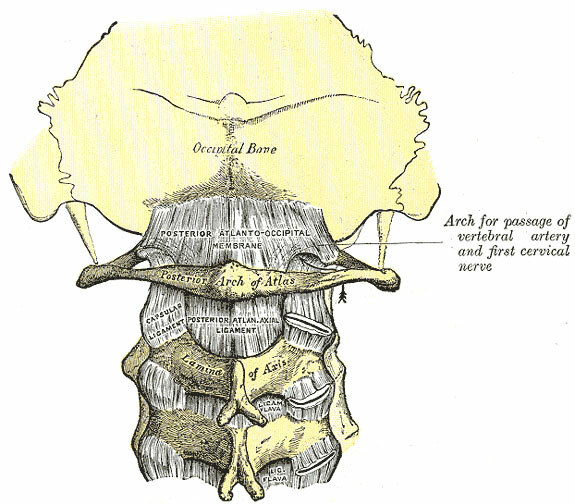 Additionally the jaw and upper neck are closely linked structurally, functionally and neurologically. 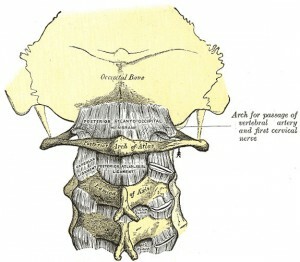 Therefore jaw dysfunction can lead to pain dysfunction within the upper cervical region. Temporal Arteritis: This occurs through inflammation of the blood vessels within the temple. It is typically felt as an aching to sharp pain and is usually unilateral. If left untreated this problem can lead to loss of vision and is usually treated with steroids.